The European Commission imposed the PSD2 to improve financial services innovation, reinforce consumer protection, and improve the security of internet payments and account access. The directive fosters a broader ecosystem with improved products and services while enabling bank customers – both consumers and businesses – to use third-party providers (TPPs) to manage their finances. 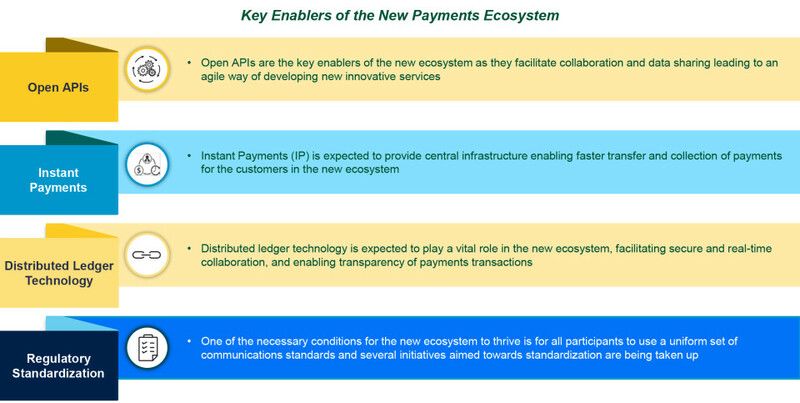 As this new, broader payments ecosystem takes shape, success factors include enthusiastic collaboration and willingness from all stakeholders to keep an open mind when it comes to next-generation payment-enabled technologies such as APIs, instant payments, and distributed ledger technology (DLT). APIs have evolved from use within the bank or with key partners, to become public, or open. Initially, banks used APIs to increase the agility and efficiency of internal business processes and used partner APIs to expand business, add new services, or open new channels. Today, open APIs are critical enablers because they facilitate collaboration and data sharing, which are so vital to the agile development of new and innovative payments services. Globally, banks are at different stages of building their API marketplace, building platforms, or taking steps such as hackathon sponsorships and innovation labs to increase industry adoption of APIs. Many leading banks across the globe have developed API marketplaces to collaborate with FinTech firms to provide retail and corporate payments-related products and services. Similarly, London-based, mobile-only partnered with a banking-as-a-service platform last year to issue its customers UK bank accounts in real time and access to the UK’s Faster Payments Service. Based on the SCT and SCTinst schemes, Jiffy is already integrated with the pan European instant payments infrastructure RT1. These apps are mainly used for real-time, person-to-person (P2P) payments and person-to-business (P2B) mobile payments for purchases at physical stores or e-commerce stores. Financial regulators support community initiatives, which usually focus on creating new 24×7, real-time, and account-to-account payment infrastructures. Examples include IP infrastructures currently under development in Europe, Canada, and the United States. Australia’s New Payments Platform (NPP), which is an open access infrastructure for fast payments, went live in February 2018. NPP also supports real-time settlement of transactions. As a standalone solution, instant payments may offer corporates limited benefits such as faster money transfer and collection. However, when combined with open-banking directives, instant payments offer significant value to e-commerce traders and B2C retailers through instant access to their funds, which leads to substantial working capital and liquidity-related benefits. As more countries implement instant payments, corporate treasurers will have to upgrade their batch-processing back-end systems to real-time processing to derive the most benefits. IP is expected to provide a central infrastructure that enables faster payments transfer and collection. DLT can potentially help facilitate transparent, secure, fast, and cost-effective payment transactions in the new payments ecosystem. Banks such as BNP Paribas and RBC in collaboration with SWIFT are experimenting internally with DLT to develop digital payments platforms that can scale to deliver cross-border payments. BNP Paribas ALM Treasury have completed a pilot demonstrating the use of blockchain to improve operational efficiency by providing a more integrated cash management approach between businesses, allowing greater flexibility and a 24×7 capability. Some leading banks have entered into partnership with Ripple to provide DLT based cost-effective solutions for low value cross-border remittances, international cash pooling, and conditional transfers to their clients. However, the existence of different standards for these diverse solutions may lead to interoperability challenges in the short- to mid-term, eventually resulting in consolidation in the industry in the longer term. SWIFT’s DLT pilot test for bank-to-bank transfers was successful and demonstrated that DLT could provide the functions needed for Nostro account reconciliation. Industry participants are looking to address specific concerns such as scalability and security challenges, and with mitigation, DLT adoption may increase. A uniform set of communications standards is an essential success factor within the new payments ecosystem; and several standardization proposals are being considered, worldwide. The Single Euro Payments Area (SEPA) is a payment-integration initiative of the European Union for simplification of bank transfers denominated in euro (€). The FIDO (Fast Identity Online) Alliance is a consortium that focuses on biometrics to address the lack of interoperability among authentication devices. Some API standardization initiatives such as the Banking Industry Architecture Network (BIAN), Open Banking Working Group (UK), Open Financial Exchange (United States), and the Open Bank Project (Germany) are expected to further increase the adoption of APIs in both retail and corporate payments. SWIFT GPI, which has onboarded more than 150 leading banks, could emerge as the new standard in cross-border payments. Nexo standards are ISO 20022-based, open and global standards aimed at removing the barriers present in current fragmented global card payment acceptance ecosystem to enable interoperability in payment acquisition space across different regions. However, there are still standardization and harmonization challenges that are slowing the pace of ecosystem development. Disunity is the result of the diverse standards of various national regulators as well as disparate interpretation of regulations. For example, as PSD2 is transposed into national laws across European Member States, a lack of harmonization is apparent. Moreover, the absence of a central API infrastructure has resulted in banks in different countries creating open API platforms by collaborating with a range of industry stakeholders. The Open Banking Working Group is a collective of banking, open data and FinTech professionals. It was formed in 2015 at the request of the UK government and aims to develop a framework for adopting an open API standard across banking and explore how open banking will impact consumers, regulators and industry. IndiaStack is a set of APIs that allows governments, businesses, startups and developers to utilize an unique digital infrastructure to help India enable paperless and cashless payments. Hong Kong Monetary Authority website, http://www.hkma.gov.hk/eng/key-information/press-releases/2018/20180111-3.shtml, accessed March 2018. Finextra website, https://www.finextra.com/newsarticle/31748/canadian-government-to-review-merits-of-open-banking, accessed March 2018. Reuters, “U.S. banks move to broaden reach of Zelle instant payments app,” David Henry, https://www.reuters.com/article/us-usa-banks-payments-zelle/u-s-banks-move-to-broaden-reach-of-zelle-instant-payments-app-idUSKCN1BJ1GO, accessed March 2018. Tieto website, https://campaigns.tieto.com/payments-ecosystem, accessed March 2018. SIA website, http://jiffy.sia.eu/en/send-receive-money-with-jiffy, accessed March 2018. Bizum website, https://bizum.es, accessed March 2018. Reserve Bank of Australia website, https://www.rba.gov.au/media-releases/2018/mr-18-02.html, accessed March 2018. SWIFT website, https://www.swift.com/our-solutions/global-financial-messaging/payments-cash-management/swift-gpi/members, accessed March 2018.